Quantitative imaging analytics is high-tech terminology for turning medical images into hard data that can be used to make better decisions and recommendations. Radiologists have always had a responsibility to their referrers and patients to provide the most accurate, meaningful reports they can. This responsibility has never received greater attention than in health care's increasing emphasis on receiving value for each dollar spent, for every image acquired, and for every mGy of dose deposited. But a traditional study read has its limitations in what even the most experienced radiologist can determine from the images. Even the most up-to-date PACS or specialized viewer generally provides only tools for the radiologist to make a largely qualitative assessment of a study. What is often lacking is extraction of more insightful, quantitative information from the pixel maps, as well as readily available data from prior exams and the medical histories that can add context to a patient's current exam. The following are some examples of the quantitative imaging analytics applications. Imaging Biomarkers. In an oncology context, quantitative information can extend beyond basic measurements, such as tumor dimensions, to features describing the intensity, shape, and texture of a structure within an image set. The rationale behind assessment of properties such as how heterogeneous a tumor appears on an image is that this is correlates with the underlying biology and gene expression patterns, which in turn correlate with outcome and response to treatment.1 Noninvasive imaging can then potentially act as a surrogate for a physical tissue extraction and analysis. Such features are sometimes referred to as imaging biomarkers. The relatively new field of radiomics—analogous to genomics done via imaging—is the extraction, quantification, and analysis of imaging biomarkers with the goal of discovering correlations with clinical outcomes. One appealing aspect of more sophisticated properties such as those based on image texture is that more concrete conclusions about the patient's prognosis may be able to be drawn based on just a single exam. Typically it is growth or shrinkage of a lesion between exams that is the most important indicator of likely outcome. With more biologically representative features than just size, more confident predictions may be able to be made without waiting for follow-up images. Nevertheless, tracking of lesion size across exams remains a valuable tool, especially if this can be efficiently incorporated into the usual workflow of importing an exam and reporting on it. The key to that task is having the images and data from relevant prior exams readily available and automatically associated with the current exam. EHR Data Integration. A common inconvenience and time-waster for radiologists is lack of ready access to EHR data during an exam read. Health records are often in a different data silo and accessible via different software than imaging data. Today it is technically feasible to pull EHR data into the reading environment. 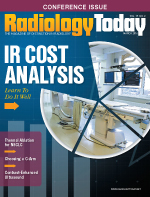 With the right connectivity and user interface, a radiologist can display nonimaging and imaging-related data alongside each other. In particular, a longitudinal history of the patient's care including EHR information and quantitative image-based data can be assembled. As well as the advantage data integration offers for assessing an individual patient, access to EHR and imaging data across groups of patients provides the broad context required for analytics and decision support. Cohort-Based Analytics. One essential ingredient of evidence-based medicine is basing clinical decisions on past results in an empirical way. What has happened in the past to a group of patients, or how they have responded to a given treatment, is a good indicator for the outcome of a current patient similar to that group. Clinical trials are commonly the basis for evidence-based medicine, but useful guidance may also be gleaned from histories available in a local or shared database of routinely managed patients. For example, a cohort of patients may be defined based on characteristics of the current patient and analytics carried out on this group to examine their response to a certain drug, or five-year survival after diagnosis. Characteristics may be image related, may pertain to demographics or health records, or may be a combination of many factors as enabled by disparate data integration. Such cohort-based analytics is an area where Big Data and machine-learning approaches can play a role. Powerful computers with access to large databases of information about past patients can discover correlations between the characteristics of a patient and their disease diagnosis or likely response to treatment. The hope is that clinical guidance for new patients will become available through identification and analysis of the outcomes for relevant pockets of previous patients. With the ability to evaluate data derived across patient cohorts in a database, all patients in a system could become part of evidence-based analysis. Radiologists would be able to tap findings from across all patients, rather than only the 3% of cancer patients in clinical trials. Screening Applications. Lung cancer screening is an interesting potential application of more advanced image analysis and cohort-based analytics. Factors such as nodule size, texture, growth between exams, smoking history, age, nodule location, etc, could be used to define a cohort. Picking only those patients who satisfy the selection criteria and revealing the likelihood that they had a conformed malignant lesion can help in making follow-up recommendations for the current patient. It has been shown in the National Lung Screening Trial (NLST) that low-dose CT-based lung screening can catch cancers earlier and save more lives than chest X-rays.2 However, the study also showed that the increased sensitivity of CT screening came a high cost of false positives; 24% of all CT scans were flagged as "positive" (compared with 7% of chest X-rays), but more than 95% of these were false positives. This cost is not inherent in CT-based screening, but is more related to the positivity criteria used: any noncalcified nodule of at least 4 mm in diameter. False positives can be reduced by making a screening test more specific; this generally requires the tradeoff that the test is less sensitive. The discovery and use of prognostic imaging biomarkers such as measures of nodule heterogeneity and shape irregularity may help in reducing the magnitude of this tradeoff. A common biomarker for malignancy is growth of a nodule between scans; however, this of course requires waiting until the next scan before the growth metric can be calculated. A high-specificity/high-sensitivity biomarker based on the radiological appearance of a nodule in an isolated exam is therefore very appealing. This is a topic of interest in radiomics research. A more mainstream approach in the effort to improve the proportion of screening exams correctly flagged as positive is the ACR's Lung-RADS tool. This uses nodule growth as well as size and consistency in arriving at a category associated with a recommended follow-up strategy. A reanalysis of the NLST data using Lung-RADS resulted in halving the false-positive rate with only a moderate reduction in the true-positive rate.3 Perhaps, ultimately, the incorporation of more sophisticated imaging biomarkers into a version of Lung-RADS will further reduce the specificity-sensitivity tradeoff. Cohort analytics could be developed using past screening candidates with known diagnoses and known imaging characteristics, demographics, and medical records. Groups of past patients who are similar in selected, clinically relevant ways to the current candidate can be used to help assess their likelihood of a cancer diagnosis. HealthMyne (www.healthmyne.com) has received FDA 510(k) clearance for its software's PACS functionality, as well as its imaging analytics capabilities. Its objective is to add sophisticated image analysis features and the ability to query information from EHRs, starting with oncology images. Lung cancer screening and treatment response monitoring is the initial priority for product development and commercialization efforts at this stage. HealthMyne is engaged with collaboration partners on topics such as extraction of relevant imaging biomarkers for predicting lung cancer diagnosis and prognosis. Workflow needs such as ready availability of EHR-based information during radiology reads are also being addressed, along with display of image-based and EHR-based data in a patient care timeline. Storage of information such as lesion sizes, growth, and other biomarkers in a tabularized format is a key part of the product, in line with industry guidelines on structured reporting. In support of lung cancer screening programs, automated determination of the ACR Lung-RADS categories is being implemented. — Peter Hoban, PhD, is the director of product management at HealthMyne. 1. Aerts HJ, Velazquez ER, Leijenaar RT, et al. Decoding tumour phenotype by noninvasive imaging using a quantitative radiomics approach. Nat Commun. 2014;5:4006. 2. Aberle DR, Abtin F, Brown K. Computed tomography screening for lung cancer: has it finally arrived? Implications of the National Lung Screening Trial. J Clin Oncol. 2013;31(8):1002-1008. 3. Pinsky PF, Gierada DS, Black W, et al. Performance of Lung-RADS in the National Lung Screening Trial: a retrospective assessment. Ann Intern Med. 2015;162(7):485-491.